PAUSE IN TAKING NEW COMMISSIONS! I can take new orders in the middle of June after the Finnish Hobbyhorse Championships. Mimesis Hobbyhorses are high quality handcrafts from Finland. The artist behind the horses is Saila Jantunen, a circus student and a private entrepreneur (business ID: 2661629-2) who made her first hobbyhorse in 2003. My passion is to fullfill dreams by creating custom made hobbyhorses precisely according to customer's wishes. I love to make imitations of real horses but the customer can also design their own horse, only imagination is the limit. Mimesis Hobbyhorses are 100% handcraft. All of the horses are unique and one of a kind, I don't make copies of already existing hobbyhorses. Mimesis Hobbyhorses are currently available only in the area of European Union. 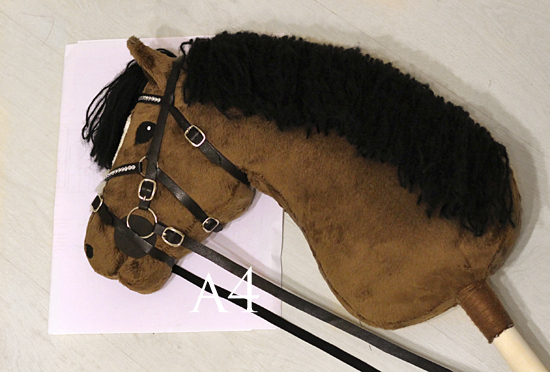 If you wish to order a hobbyhorse, please read through all the information in this page. You will find an order form with my contact information below. After sending me email, I will give you the final price and the estimated production time. The production time varies from 1 to 4 weeks depending on my studies and the amount of commissions in the line. When your order is ready, you recieve a bill and pictures of the horse. I ship the horse after recieving the payment. If the horse doesn't please you, you don't have to purchase it. Almost all kinds of horses are possible to create but I am not currently making pinto coloured horses because they take so much time. Please contact me before placing an order if you have some special colourings in mind so we can discuss if they are doable. If you wish me to make an imitation of a real horse, please send me some pictures of the example horse. - Please be sure about your order, you can not cancel it after I have started to make the horse. - If you are not pleased with the horse, you don't have to purchase it. - Method of payment is bank transfer. Other methods are not possible. - I ship the horse after recieving the payment. - If you are under 18 years old, you must have a permission from your parents to place an order. The price of a custom made hobbyhorse begins from 270€ + 30€ shipping. It contains colourings, markings, normal mane (length 10-40cm) and shipping with fillings but without the stick to all EU-countries. The price doesn't include tack but I have a separate price list for bridles, halters etc. that you can order for your horse. Mimesis hobbyhorses are shipped with the fillings but without the stick. I ship the horses the next day after recieving the payment. All packages include a tracking code. Arriving of the package usually takes 2-7 days depending on the destination country. Shipping is currently possible only to the area of European Union. If you are under 18 years old, you must have the permission of your parents to place an order. - Tack: Model, colour, decorations? Example of a horse. Some horse breeds might be slightly smaller. Example of a pony. Some pony breeds might be slightly smaller.